We’ve done a comparison of these new models. The 4100, 5100, and 6100 have some great features that are available as part of all Sonicare’s toothbrushes because the company is known for them. This brand-new line of toothbrushes have some really exciting features unique to each toothbrush, so we’ve broken them down for you. The ProtectiveClean 4100 is focused on reducing plaque. There’s one cleaning mode with the 4100. It’s meant to impact directly on the amount of plaque that is removed from between teeth and below the gum line. It boasts 7x more plaque removal than manual toothbrushes. Sonicare has sonic technology in their toothbrushes. You’ll be getting all of the benefits you’d expect. There’s a Smartimer to encourage you to brush for the dentist recommended two minutes. Each time you brush, that Smartimer will keep you on track. The Easy Start feature is great for those who have never used an electric toothbrush before. It’ll start at a lower power and slowly increase in power as you get used to the brushing experience. Over time, it’ll ease you into the full power of the sonic brushing technology. The ProtectiveClean 4100 comes with one Optimal Plaque Control brush head. This brush head will help focus your brushing for those who have a problem with plaque buildup. It’ll do so in a gentle manner. 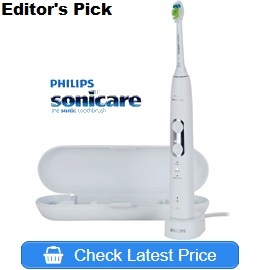 This line of toothbrush from Philips concentrates on providing its benefits gently. 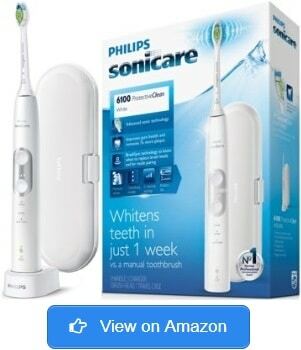 The 4100 electric toothbrush has all the great features of the Sonicare brand. It comes with Smartimer, pacer, and a long battery life. For each charge, you’re getting 2 weeks of battery life. While this toothbrush doesn’t have a travel case, it can still travel quite well. The 4100’s Easy Start provides gentle power as does the toothbrush itself. This line centers on gently providing benefits. The toothbrush doesn’t allow a huge amount of pressure on your teeth as you’re learning, either. That can be an issue with those who are going from a manual toothbrush to electric. ProtectiveClean 4100 also has BrushSync technology that calculates the pressure you’ve been using plus the time you’ve been brushing. It’ll let you know when it’s time to change the brush head. There’s no travel case with this toothbrush. The 5100 concentrates on gentle yet effective gum health. There are three modes of cleaning. Clean is what you would use normally. Gum Care is the focus of this toothbrush. White is meant to whiten your teeth. With this toothbrush, you’ll get the Smartimer to help you stay on track. Dentists recommend two minutes of brushing. The timer will alert you after the time has passed. The pacer in this brush will make sure you’re moving from one quadrant to another in the allotted two minutes, too. Included in this toothbrush kit is the toothbrush handle as well as one Optimal Gum Care brush head. It’ll concentrate on providing focused gum care for healthier gums. Along with the focused brush head, the 5100 comes with bits that you’ll need for traveling with your toothbrush. There’s no reason you should leave this toothbrush at home when you’re on the road. It comes with a travel case to keep your toothbrush clean and free of dirt. The charging base is compact, too. The 5100 has a pressure sensor to ensure that you’re not brushing too hard. With 31,000 brush strokes per minute, there’s no reason to press down to scrub your teeth. 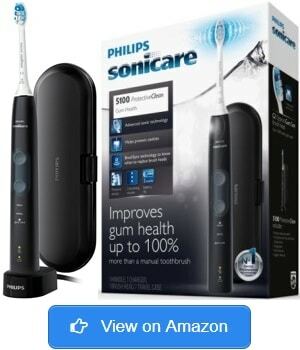 As far as the 5100 goes, it’s a lovely toothbrush with plenty of features that make it a huge benefit. The way it concentrates on gum health will ensure that your gums will always be at the height of good health. You could even reverse some serious gum problems when focused on that area. It’s a definite plus to have the pressure sensor. Most people who have gum issues will bear down and give more vigorous cleaning to the gums. It’s the right idea, but it can actually do a lot of harm. It’s best to allow the sonic action to do all the work. The alert on this brush will help retrain your brushing habits. This toothbrush is safe for gums as well as any dental work you might have. Braces, fillings, and veneers will always be safe with the sonic toothbrush. It’s not going to rattle your dental work. The 5100 doesn’t have BrushSync pairing to recognize the type of brush head being used. The ProtectiveClean 6100 fixes its attention on whitening. It provides a whiter smile in just one week compared to a manual toothbrush. There’s a Whitening mode as well as a Cleaning mode, which is for everyday clean. The toothbrush also comes with a Gum Care mode. There is a pressure sensor in this handle that will alert you when you’re brushing too hard. Removing plaque and stains isn’t about the pressure you exert over the brush against your teeth. It’s the sonic technology that makes a difference in your smile. There are 31,000 brush strokes to remove stains without pressure. Included with the handle is the Diamond Clean brush head. The handle is compatible with all the brush heads in the Sonicare line. The 3 modes of cleaning will pair with the right brush head due to the BrushSync technology. It will also alert you when it’s time to change out the brush for a new one. That happens approximately every 3 to 4 months. The 6100 has a battery charge indicator on the handle. The toothbrush can hold a charge for 2 weeks, so it’s important that you’re able to see when it needs recharging. You might forget to charge after a week or more. The charger and travel case are included in this kit. As far as the 6100, it’s a terrific toothbrush to focus on whitening your teeth. If you want a brighter, whiter smile, this comes with the right brush head for the job. The Cleaning and Whitening mode are designed to remove stains as well as plaque. Plaque can dim your smile as much as stains can. Like the other Sonicare toothbrushes, this one comes with a Smartimer and pacer to alert you to the proper brushing time. It encourages a full 2 minutes of brushing. It can be longer than you expect, so it’s good to have the timer. The 6100 starts off easy with the Easy Start mode. You also have the ability to choose an intensity setting. There are 3 settings for you to choose from with this toothbrush. The intensity can be high for beginners who have never used an electric toothbrush before. That’s the overview of all the toothbrushes in this new ProtectiveClean line. Now, it’s time to dig into the differences from one model to the next. The 4100 and 5100 have some of the same features since they’re available as part of the Sonicare line. They both have a Smartimer. It helps the person brushing to stick with the 2 minutes of cleaning recommended by dentists. Two minute brushing is supposed to happen twice per day. It’s unlikely that many people who are using a manual brush are brushing for long enough. It’s longer than you’d expect without a timer to keep you on track. After the two minutes is up, an alert will sound that tells the user that he or she can be done brushing. You can always continue brushing if you like. It might be the time that you switch from regular cleaning to a deeper cleaning, too. After the first two minutes, you can switch from Cleaning mode to Whitening or Gum Care. 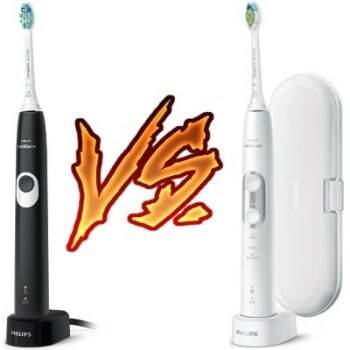 The choice is yours, and based on the model toothbrush that you pick. There’s also a Quadpacer that will beep to let you know to switch to a new quadrant of your mouth. All 4 quadrants should get a full 30 seconds of brushing. If you want to use the Quadpacer, you will need to keep track of what portion of your mouth has been brushed. All four need equal attention. 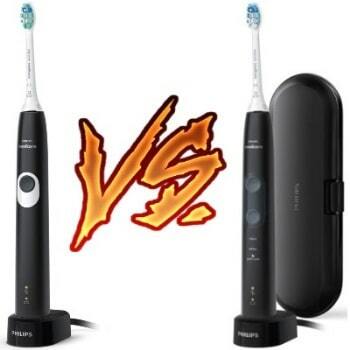 Both toothbrushes have a battery charge light. They allow for 14 days of battery life per charge. The Li-Ion battery holds a charge for a very long time, but it’s important to stay on top of the charge. You don’t want to be left with a dead toothbrush. The 4100 and 5100 both have a pressure sensor, too. It’ll keep you from putting undue pressure on your teeth when brushing. With both toothbrushes having 31,000 strokes per minute, there’s no reason to scrub the teeth. Scrubbing leads to receding gums. It can also lead to problems with your enamel being scraped from your teeth. Enamel protects the teeth and shouldn’t be removed through scrubbing. Each toothbrush has a 2-year warranty from the company. The warranty will cover serious issues that result from the manufacturing. It won’t cover abuse and maintenance issues resulting from the toothbrush owner. The ProtectiveClean models all have the motto of providing a gentle cleaning experience. With that in mind, there’s an Easy Start mode on the 4100 as well as the 5100. They both have a brush head included in the kit. The 4100 gets an Optimal Plaque Control brush head. The 5100 gets the Optimal Gum Care brush head. BrushSync replacement reminder will actually calculate how long you’ve had the brush head. 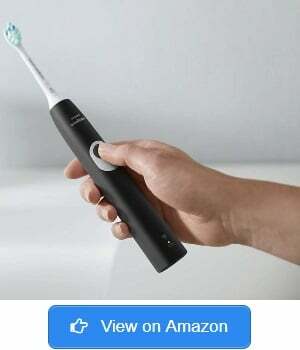 It’ll track how often it’s used, and the pressure used during brushing. All that information will be used to recommend a time that the brush head should be replaced. The 4100 is the first in the line of ProtectiveClean toothbrushes. It’s the one that has the most basic of features, too. There’s only one cleaning mode versus the 3 cleaning modes that is available in the 5100. The 5100 is meant to concentrate on gum care, which is why it has the Gum Care brush head included in its kit. There’s also a mode that narrows in on the gums. As far as the 4100, that model features a plaque cleaning mode focused on removing as much plaque as possible. The ProtectiveClean 4100 has Clean as the only mode available. The 5100 has Clean, White, and Gum Care modes. There’s also a light on the handle that will show the mode being used on the 5100. The 4100 does have this lighted icon. The 5100 comes with a travel case, which isn’t included in the kit for the 4100. First, let’s cover the areas where the 5100 and the 6100 are the same. They have the same number of cleaning modes. There are 3 in each toothbrush. There’s the Clean mode, which provides daily, thorough cleaning. There is the whitening mode, which will remove stains. The Whitening mode concentrates on removing stains from things like wine and coffee. Many people need this kind of stain removal since they drink coffee and wine regularly. It’ll also whiten your smile by removing stains from things like foods that you consume. It can get plaque removed from the teeth, too. That can also impact the whitening process. Without using any kind of whitening toothpaste or whitening strips, you can see a significant difference in the whiteness just from brushing alone. Finally, there is the Gum Care mode that will massage the gums. Diseases like gingivitis can be reversed by attention paid to the area. The Gum Care mode applies 31,000 brush strokes to the gums. It can remove plaque as well as bring gums back to good health. Many people brush too aggressively, which can cause gums to recede. The effects of aggressive brushing can be reversed quickly. Especially when you’re switching from manual brushing to sonic technology. Each cleaning mode has an icon on the handle itself. You’ll be able to see what mode you’re in by looking at the lighted handle. On the handle, it’ll be easy to see the battery charge light, too. It’ll alert you to when it’s time to recharge. There’s a Smartimer available in these two models like the 4100. The timer might seem like a small feature, but it’s vital to good oral hygiene. Your dentist recommends that you spend two minutes brushing your teeth twice a day. Two minutes can be much longer than you think without a way to time it. You’re likely not spending enough time on your brushing. The 5100 and 6100 both have the Quadpacer included in the handle. It’ll pulse to let you know when it’s time to move. You’ll have to pay attention to the areas you’ve done previously to ensure you get them all. Each toothbrush model has a pressure sensor. Sonicare understands how important it is to keep a gentle pressure and allow the sonic nature of the brush to do the work. You should never scrape or scrub your teeth and gums to get them clean. In both toothbrushes, you’ll find the BrushSync reminder for when it’s time to replace the brush head. It’s based on a few factors like time spent brushing and pressure while brushing. The 5100 is focused on Gum Care while the 6100 is meant for Whitening. For that reason, the two come with different brush heads. The 5100 has the Optimal Gum Care brush head while the 6100 has the DiamondClean. As far as features that are available in the 6100 versus the 5100, you’ll find the pairing mode. When you have purchased more brush heads, they’ll automatically be paired with the right mode. The 6100 also has 3 brushing intensities. Those are not available in the 5100. The intensities are meant for your personal comfort. You can pick the speed – low, medium, or high – that works best for you. The first in the line and last in the line, the 4100 versus the 6100, is where you’ll find the most differences. There are still many similarities, though. All of the great things that you’ll find with the Sonicare line are available here. The Smartimer is the first feature that’s the same. That two minute recommended brushing time from dentists is vital. They have been telling us for years and years that brushing for two minutes matters tremendously to your oral hygiene. Yet, we still don’t spend enough time brushing. The timer will alert you when you’ve spent the required two minutes. There’s no longer any guessing about how much time is left. You’ll notice when you’re brushing that you would have thought you were finished sooner than the timer indicates. In the 4100 and 6100, there’s the Quadpacer, too. This pacer will pulse when it’s time to change sections of your mouth. You should think of your mouth in 4 quadrants to ensure that you’re hitting each area. The two models have a pressure sensor, too. It’s a standard addition to many of Sonicare’s toothbrushes. They understand that you should never scrub the tooth to remove plaque or food. It’s unnecessary anyway. The sonic technology will get your teeth incredibly clean. Scrubbing hard is a bad habit from manual brushing. The toothbrushes will alert you to the fact that you’re pushing down too hard. It can take some time to retrain yourself to brush properly, but the 4100 and the 6100 will help with that. 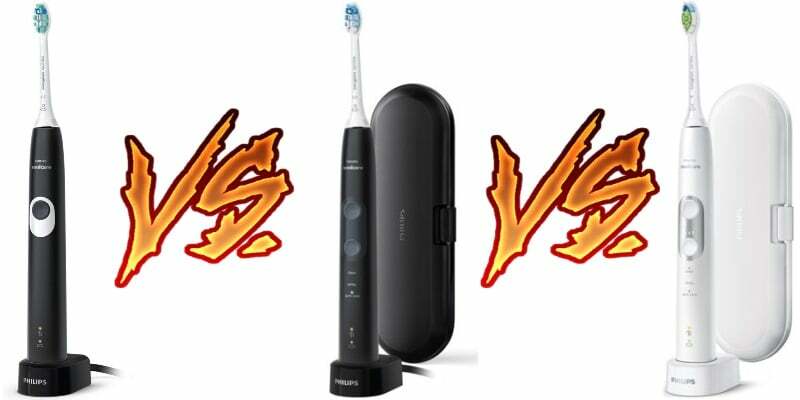 The battery life is 14 days for the 4100 and the 6100 toothbrush. You can charge it fully and have 2 full weeks of brushing before worrying about a recharge. It makes the toothbrushes from Sonicare a great travel toothbrush. You don’t have to give up electric toothbrushes just because you are going on vacation. Now, it’s time to get into the differences between the 4100 and the 6100. There are quite a few. The number of cleaning modes is a huge difference. The 6100 has 3 modes; Cleaning, Whitening, and Gum Care. The 4100 only has one mode, which is cleaning. The 4100 doesn’t have any brushing intensity modes. They both have an Easy Start mode that will start slow to help beginners get used to electric brushing. The 6100 has separate settings you can pick for yourself from low to medium to high. As far as BrushSync, they both have a reminder of when the brush head should be replaced. The 6100 goes a step further. The BrushSync pairing mode will change the mode automatically based on the brush head you’re using. You can purchase extra brush heads for both models, but the 6100 is the only one that will recognize the brush head. It’ll change to the right mode automatically based on the head chosen. The 4100 comes with the Optimal Plaque Control brush head. The 6100 comes with the DiamondClean brush head. The pairing mode would choose whitening for the 6100’s DiamondClean brush head. The 6100 comes with a travel case but the 4100 does not. You can easily take them both on vacation with you, but you are going to have to make arrangements for a space in your bag for the 4100. This is a complete, deep breakdown between all three of the ProtectiveClean’s toothbrushes. The 4100, 5100, and 6100 have many similarities, but in the differences, you’ll find the right toothbrush to fit your needs. They each focus on a different area from gum care to plaque removal to whitening. That might be enough to help you make your choice. If it’s not, the comparison table should help you make a firm decision. As far as our recommendations, we would choose the 6100. It has all the best features common for all Sonicare toothbrushes. There are advances that make it worth choosing. The brushing intensities as well as the BrushSync technology are a big plus for a sonic toothbrush. 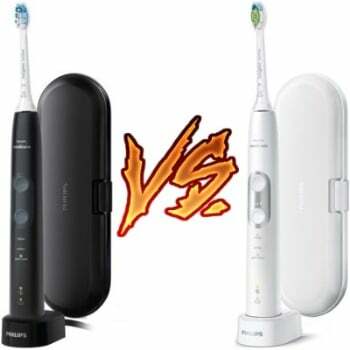 Philips Sonicare 2 Series vs 3 Series: Which One to Choose?